My Q1 - A Hobby or a Madness ? - words by Rob. The Background . . . .
After a break from building a 'Princess Marina', I wanted to build another locomotive, something straight-foward, life was getting crammed full of other demands on my time. 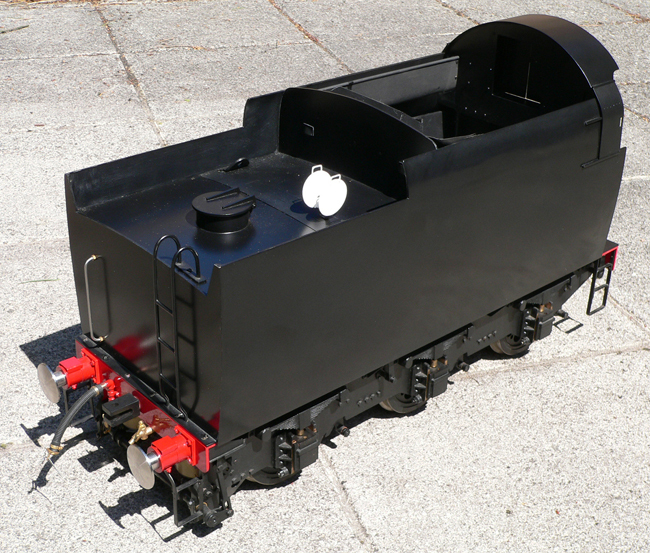 A 5" gauge 0-6-0 would probably be ideal, easier access inside the frames and smoke box, no non-driving wheels to cause extra work, and a separate tender to make it lighter. 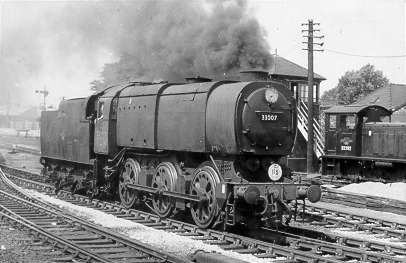 And there, nagging me from years before, I had a postcard photo of Bulleid's 'Q1', the Southern Railway war-time 0-6-0 austerity. Probably because I grew up in the diesel age, I considered the odd tunnel shaped smoke box and boiler casing somehow appealing, and since there would require no running boards - well - less to make ! I also reckoned that it could be based on 'Pansy' running gear, for which I obtained drawings from a club member. Here, I convinced myself, was an 18 month quickie ! It is daft how we can justify the most unresearched decisions . . . I had no working drawings, no castings, limited engineering skills, and had never seen the prototype, (if it still existed); but such is the power of adrenaline, I was convinced this was the way to go ! I contacted British Rail / Oxford Publishers to try and get some drawings. I found some tender detail was available, but only General Arrangement and pipe work layouts for the locomotive. (Such drawings are available through York Museum these days). So, a full couple of months was spent musing on basic design, including scaling out to make working drawings; first setting a hacksaw to bare metal in Dec 1987. I was also pleased to receive helpful responses from model engineers both locally, and in far away 'Southern' territory. From the M.E. magazine, Jim Ewin's computer formula for boiler calculation was used to get the best characteristics for what should be a good steaming boiler, and I had this built for me quite early on, (well this was going to be a quick build). A friend also found a useful drawing in the M.E. of the 'Q1' valve gear (Vol 143 No. 3560 6 May 1977 Page 495), which was timely, as I realised that 'Pansy' was not really suitable at all. Actually the gear from 'Stratford' is quite a close match and could have been used, (it can hardly be seen anyway); but I decided to build it closer to true scale although adapted for slide valves. I also replied to an invitation in the M.E. by (the late) Prof. Bill Hall, for a computer program to design the Stephenson's valve gear, using this to optimise the valve events, rather than relying on a scaled up the drawing. At that time, this meant using the 'BBC-B' computer at my local primary school, which was quite a distraction for the children ! Critical to success of the project would be a set of convincing driving wheels, unavailable commercially. After scrupulous study of books and magazine photos, I made a pattern for the unusual solid 'Boxpok' driving wheels, using car body filler, which was sent to the late Norman Spink for casting. On receiving and turning [machining] these distinctive wheels, I felt things had really started to progress, and consider the time spent in 'pattern making' was worth while. Of course, starting a build is a daunting task, no ready made parts here, everything had to be made, then test assembled, involving long hours of sawing, filing and turning; but it is an exciting stage. I've spent many hours in contemplation and the preparation of working drawings prior to making bits. Not knowing better, I fitted traditional 'Pansy' horn castings to the frames; in fact there should be simple castings to each side of the frame openings, not across the top, which would also have eased fitting of the boiler. The loco axleboxes are split horizontally, with typical 'LBSC' style coil springs; I didn't realise then that the front and rear driving wheelsets should have leaf springs. The construction of locomotive and tender frame sets originally proceeded together, and there is something rewarding about this initial stage of assembly, as the object previously viewed only as flat 2 dimensional drawings, suddenly gains a 3D shape and bulk, a tangible product of all that time spent with pencil and paper. Since I had far more information about the tender, and was offered a large sheet of 16 gauge brass for a reasonable sum, effort was switched into constructing it's body. No rolls were available to me to develop the slow curve in the 21" slab sides, so these were formed by foot pressure, gradually applying my weight to the panels clamped to a bench (well, jumping on them actually). This though was dependant on regular annealing of these large brass pieces; and in my small workshop during summer heat, things got quite warm ! After that, I couldn't bear to solder all that brass together, and risk distortion; so the tender has been screwed and glued. At least taking this route has ensured that the tender has been built, now finished and painted. Certain jobs caused me apprehension, particularly making the crank axle, which was put off for several years ! I also dodged the issue of a 'steam reverser' fitted to the full size 'Q1' having no understanding of it's working, although aware that using a traditional reverser hidden under the boiler casing might be regarded as cheating. An item in the April 1991 Bristol Club magazine, on a working 'steam' reverser was really helpful; and I have now built a scale working 'Q1' version. One cylinder contains the steam powered piston, the other an oil lock piston to control the speed of the motion (forcing oil from one side to the other), and to stop the lifting arm from moving off setting; but this still needs finishing off. I found the sole preserved 'Q1' residing (at that time) on the Bluebell Railway, and travelled 4 hours to find it in lots of pieces, (the first time). Viewing things in 3D brings a new understanding; "so that's what it is" - closely followed by a resigned "I'd better change mine then", and so new bits got added ! The later opportunity of an afternoon on the footplate of the 'Q1' in steam, made me determined to be reasonably accurate. Particularly, I feel the cab should be convincing - after all this is our opportunity at being an engine driver, and is an area where other people always want to look. I have therefore spent quite a lot of effort trying to get the cab controls looking reasonably to scale, and the steam turret and injector valves have swallowed a lot of time. Sometimes it's better to keep it simple. But in construction there are many times when nothing seems to go right; my favourite is breaking a tap in a blind hole, (a trick I should have learnt earlier is to drill slightly oversize tappping holes); or when I've forgotten to allow for something on my drawings and things don't fit - grrr ! (that's why we pay lots of money for a set of proven drawings I guess). Plus the times when I think there must be more to life than being shut away, making endless fiddly bits which always have to be exactly the same ! Being in the right mood is definitely tied to a successful session. But when the part is finished and fitted in place - it all suddenly becomes worthwhile. I constructed a wheeled building stand to move the locomotive around the workshop, as it's way too heavy to lift with the boiler on; this is fitted with sets of ballraces under the driving wheels to enable use as a rolling road. Somehow reality is always different . . . . The often traditional way of oiling the axleboxes through the wheel spokes doesn't work with BFB wheels, so I've made fairly scale oil boxes, and 1/16" pipes running down to the axleboxes. Even the smokebox door is complicated by being sealed with 8 individual dog-nuts; then there's the 5 nozzle blast-pipe to figure out ! (though I have made that now). Its evident that my '18 month quickie' turned into a rather long project. Where did all the 'youthful' simplicity go; (probably the same place as my youth ! ), and so much for getting my hands between the frames - I'm still not sure how all the valve gear will be squeezed in. As the assembly of the model slowly progressed, and I understood more from the photos, my desire to accurately capture the spirit of the original increased. Even mounting the cladding to give the right look turned into a major exercise. I've become quite shocked at the number of individual components involved, excluding nuts and bolts, (I've learn from others to keep it simple !). In hindsight, over 30 years on, I'm aware that this really was quite ambitious, but still I wouldn't have it any other way. With such a long term project, it's often been good to get feedback on finished components by showing them to friends, as their accolades can fire my motivation to keep at it. I'd like to think I'm on the final push to completion, all the cladding has now been painted, after stripping down for extra detailing, and corrections. And I seemed to spend ages drawing and making the correct 'Southern Railway' screw couplings, and got bogged down on the ashpan and dropping grate; my fault for trying to make working dampers. Currently trying to complete all the boiler fittings, particularly a fairly good representaion of the steam manifold; then looking to get a pressure test. Trouble is I got interrupted during this, then distracted, and that is where it is presently stuck.... Next I intend to finish the motion work, valves and reverser, and get the chassis running on air. After that it should be plain sailing. Ha Ha. But never mind - although still unfinished, the project continues to absorb, and stretch the grey matter. I really enjoy a productive session in the workshop, considering it good therapy. This is after all for me, is a hobby, not a career. Few of the modern day 'want it all - want it now' generation would cope with the mindset of such a long project - but sometimes that's want it takes to achieve your goal and get a result. If you can identify with that - do keep going . . .